A contemporary styled mechanical flush plate available in white, chrome and black. With dual toilet flush buttons this plate is designed to be mated to out concealed water cistern kits. A cubic styled cistern flush plate with separate half and full flush buttons. This designer finishing touch is available in chrome, black and white finishes and has an air activated flush. Designed to be used with concealed toilet cisterns. A lovely styled flush plate that has dual button air activated flushing, offering half and full flush. Supplied in white, chrome and a stylish chrome and black mix. This plate is designed to be mated with our high quality toilet cisterns for in wall installation. A brand new design, the i plate flush button is the latest in contemporary styling. 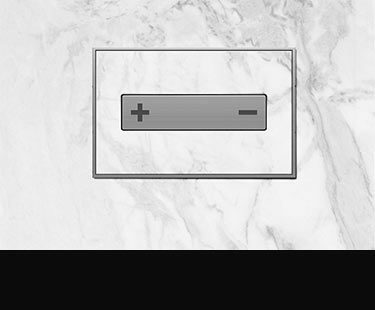 This mechanical flush plate is made of rigid ABS and is available in chrome, white & black finishes. Designer plates to be used with our toilet cisterns. Made of superior brass with a choice of chrome, gold or nickel finish. 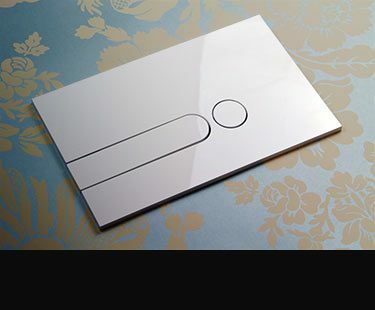 This European made flush plate is a luxury addition to high quality bathroom design. Each flush button is designed to be used with our extremely reliable hidden toilet cisterns. A superior quality toilet flush plate available in chrome, gold and nickel finishes onto a solid metal backplate. Designed in Europe to be used with our high quality hidden toilet cisterns, this air activated toilet plate has half and full flush buttons and is made in EEC. 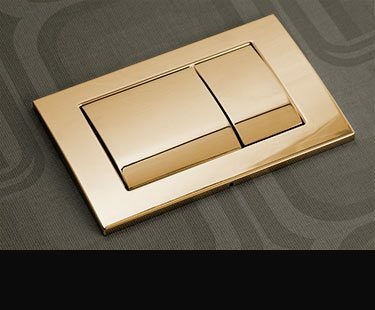 A designer flush plate made of high quality metal & coloured glass. Designed for our hidden toilet cisterns, this glass flush plate is available in black, white & aqua blue glass. Other colours available to special order. This toilet activation flush button is made of superior stainless steel. 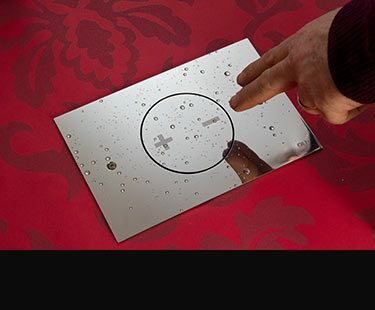 With a polished stainless finish, this cistern flush plate is designed to be used with our concealed toilet cisterns giving a stylish visual finish. A superior quality flush plate that has a recessed metal surround frame allowing for wall tiles to be cut into the plate, producing a minimalist seamless tiled effect between the flush plate and the wall. 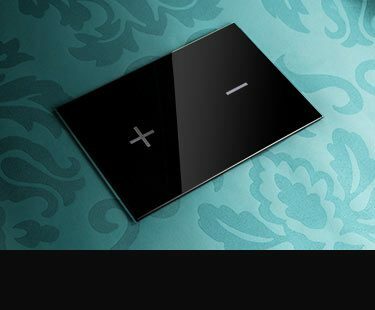 This contemporary glass flush plate is electronically wave activated and does not require being touched. Available in white and black glass. An electronic white ceramic flush plate designed to be wave activated and therefore does not require touching. This hygienic flush plate is self charging and will not require a separate power choice. 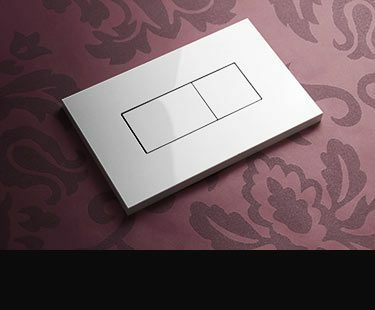 Livinghouse offer a superb collection of air toilet flush plate and mechanical flush plates designed to be fitted with our European designed and made concealed toilet cisterns. 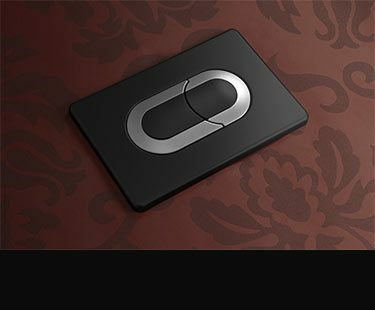 These high quality flush plates are available in 9 different flush button designs. 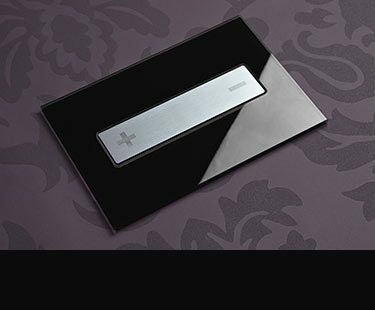 We offer many different flush button finishes and colours including rigid ABS plates in white, black and silver chrome. Glass flush plates in white, black and aqua green glass. 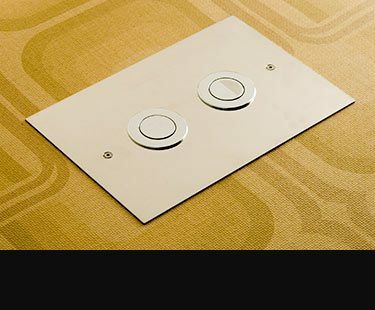 Real metal flush plates in chrome, nickel and gold plated finishes and flush button plates in polished stainless steel. 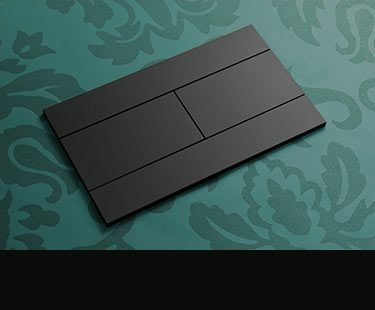 We even offer a unique recessed cistern flush plate for on-site tiling or the insetting of wood to match your bathroom design. These air and mechanical flush buttons are superb quality, have been styled with designer and luxury bathrooms in mind and produce the lovely finishing touches that high quality bathrooms require.